Wind Tunnel Simulator Available For Sale On Estore. Autodesk has released Flow Design which is a virtual wind tunnel simulator built on the Neutron Platform for mechanical and architectural applications that runs on PC or Mac. The Australian Estore site lists it for $35 per month or $200 annually. There’s an Add-in for Inventor and Revit but the standalone product can open other CAD formats. 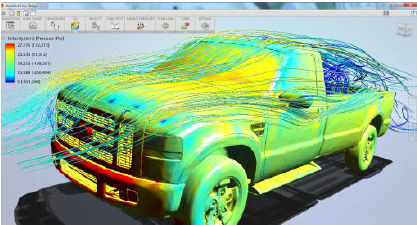 When you think of Wind Tunnel Simulation, naturally applications are for Automotive and Aerospace, however, Consumer Products can benefit from this CFD analysis and Revit users can analyse wind behaviour around closed buildings and high/low pressure regions. To find out more, check out my earlier blog, visit the labs blog site, download the design brief pdf or the preliminary validation brief pdf gives some examples in comparison to physical testing and other CFD packages.